+ Power Glove! Actually Comet. Also Hayley's Comet. Perhaps the most obvious comparison, and one of the most interesting. Mac is somewhat slowed by poor synergy with common, powerful shaper cards. Scavenge, Test Run, Personal Workshop, Code Siphon, The Supplier although functional, don't make the most of Mac's ability in all scenarios. Mac also only works with Programs and Hardware. 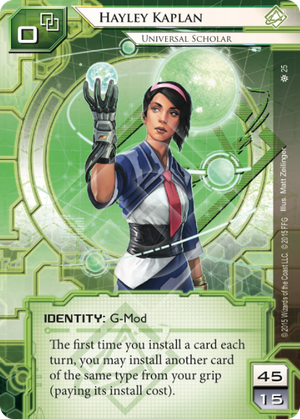 Haley can make perfect use of Personal Workshop, Self-modifying Code, or Clone Chip, on a run, and combo it her ability and with Autoscripter to boot. Test Run still allows for a saved click, as does The Supplier Replicator see excellent synergy as well. Chaos Theory: Wünderkind can setup a Shaper rig fast, by using a reduced deck size without sacrificing overall influence. CT's extra +1 is a nice bonus as well, allowing for some larger program rigs without needing additional MU cards. Hayley by contrast doesn't start with any MU bonuses, or lower variance but instead gains free install clicks over the course of the game. I suggest that whether you don't install a card at all, or have to search for it (CT) versus installing at a reduced penalty (Hayley) will be a choice of preference. Rielle "Kit" Peddler: Transhuman has her own play style. The comparison is too nuanced since Kit relies on Ice subtype abuse at a greatly reduced influence. I would only suggest that Hayley lends herself to more playstyles than Kit. The Professor: Keeper of Knowledge is a influence identity, taking more from other factions. Like Kit, the Professor lends himself to a particular play style. Exile: Streethawk is very similar to Hayley, his ability also provides click conservation during installs. Many of the windows of when his ability triggers also trigger for Hayley, although he gains a draw rather than an install, and he only triggers on program installs. Exile does start with 1 , and has the same deck size/ influence limit, but without any additional "install a program from the heap" released, his ability is perhaps more difficult to trigger. I suspect many fans of Exile will enjoy Hayley. The money's still out on Nasir Meidan: Cyber Explorer in my opinion. Like Mac, he provides a bonus econ boost, and like Kit he can pressure the corp to rez or orient ice in unusual situations. However, he requires particular setup, and many of the Lunar Cycle cards released provide significant counters to his play style. Hayley supports a diverse play style supporting single type card decks, and provides support to one of the general weakness of shaper: slow rig building. Resource efficiency I think is the most novel addition to the faction, although she supports all installed cards. Hayley supports the basics of Shaper, without particularly specialized requirements. I enjoy the overdraw turn (perhaps with Diesel or Quality Time) where I can reduce my grip to it's limit by playing two cards at once. Previously this could be done with cards like Modded, but Hayley allows this to be done with any two cards of the same type as well. In a meta where Corps are fast, taxing, and unforgiving, a Runner's Clicks have never been valued so highly. With identities like Replicating Perfection and NEH forcing you to spend your Clicks carefully, it always feels like there is a million things you want to do, but only so much time to do it. I'm incredibly excited for Hayley to make her official debut, and I think she's the first Shaper that can give Kate a clear run for her money. Let's look at how the ability works. When you install a card, you can install another one without spending the Click, as long as it's the same type (Resource, Program, Hardware). Right away, this tells me two things: One, you'll be getting rid of cards in your hand at an alarming rate and two, you'll need to make sure you have the money to support playing two cards at once. So reliable and constant draw power is a must, as well as money. Here are a few interesting synergies and options. Professional Contacts seems like a solid choice; you get support your economy and draw at the same time. The only problem is, it'll slow you down quite a bit, and if Hayley's ability focuses on setting up fast, Pro Co seems like two steps forward, one step back. Another interesting resource is Personal Workshop, which will give Hayley the option of delaying her ability. Have something in hand you want to install, but want to make sure her ability triggers? Well, pop it on PW for now, since her ability won't trigger until the card is actually installed. This also opens up a new facet of her ability; triggering it on the Corp's turn. PW, Clone Chip, and Self-modifying Code all allow her to use paid windows to get the most out of her ability. This can be used to quickly set up a RIG between your turn and the Corp's turn, given you have the cards in hand and the money to support it. You also have the option to trigger these abilities during a run, which could be deadly in a Parasite, Datasucker deck. This allows you to keep the Parasite hidden in your hand instead of in the trash with a Clone Chip in-play. A very silly synergy (that I'm still toying around with) is Replicator. Let's say you have Replicator out. From my understanding, you would be able to 1) Install an Akamatsu Mem Chip, 2) Search your deck for a second Mem Chip, 3) Install that second Mem Chip, and 4) Search your deck for the third Mem Chip ALL at the cost of a single Click! Just because of that synergy, a Replicator, Prepaid VoicePAD, Comet deck with Event based economy just gets my brain all fuzzy and warm. There might be too many gears in the machine, but that'll require further testing. And speaking of Comet, I'm still on the fence about it. The 4 cost is quite great, but it could end up paying off dearly in terms of clickless Event economy and clickless Run events. I feel it's worth mentioning since the console is obviously built for Hayley (mirrors her ability, comes out in the same data pack...she's on the friggin artwork). But it seems like something that might slow her down a ways when she's meant to go fast. Other cards to keep in mind with her ability: Underworld Contact and Dyson Mem Chip with Replicator. The Supplier though it may not be as useful as PW. I'd also look into Borrowed Satellite, since Hayley will be needing that hand-size. As for card draw, Diesel has some fun synergy with Comet, (draw 3 cards, if one is an event, play it for no Click) and is a solid, money saving card in general. I'd say Quality Time is a little too expensive for Hayley. You'll want to play your cards in the same turn, so spending 3 credits plus the cost of two more installed cards adds up fast. Pro Co keeps coming back to mind so you can just draw as you need it. There's also Astrolabe, though it's unsafe to rely on it. I'd say Diesel/Comet or Pro Co are solid choices. Money is where I'm indecisive. Magnum Opus is great in conjunction with PW. Prepaid VoicePAD with Comet could make for some amazing econ, but again, there are a lot of cogs turning. Or do you go Clickless econ with Daily Casts and Underworld/Link, but give up a lot of speed in the process? I think my favorite part about Hayley is that all of these options are solid and can make use of her ability in different ways. So the question burning in everyones' minds; is she better than Kate? I guess I'd give your standard non-answer and say that they're too different to compare. Kate's ability is far more direct of a pay-off. Is it better to save a Click or save a Credit? The obvious answer is that saving a Click is far better, however, you might not be able to trigger Hayley's ability more than 4-5 times a game, where Kate can easily save you upwards of 10 credits. Hayley also has the downside of going down to unsafe handsizes against Weyland or Jinteki, meaning you may not always want to trigger her ability. Overall, I'd say Kate is pretty objectively strong, where Hayley very much depends on the matchup and your draw. It's always interesting to see a new Shaper identity, as they always allow for some interesting builds. I think Hayley opens up the doors for a lot of interesting plays that have yet to be discovered and I hope we can figure them out.